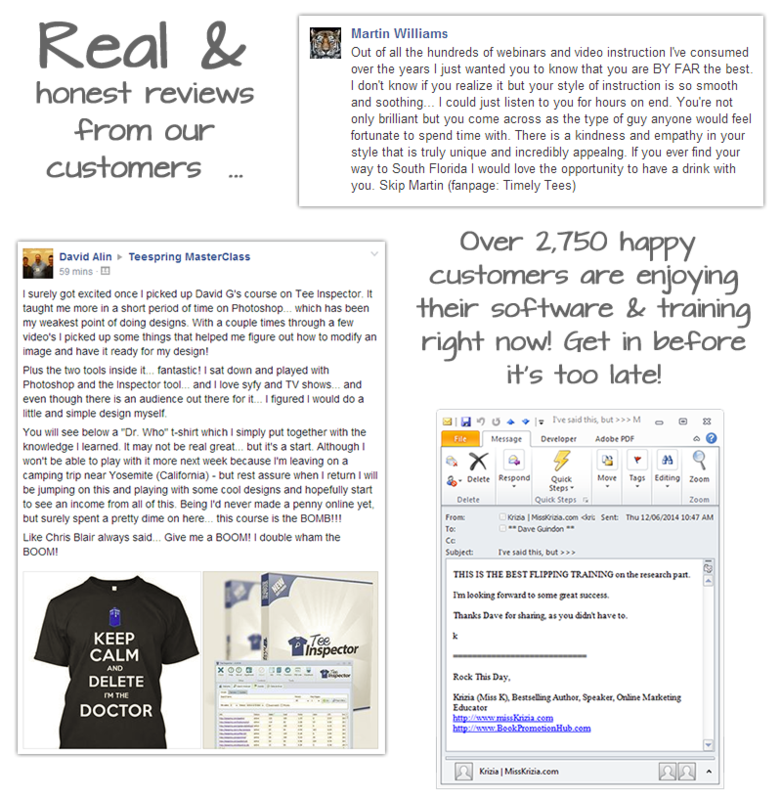 Just Released: Powerful T-Shirt Research Software Responsible for Generating Over $231,966.31 Selling Shirts with Teespring! Get this powerful Teespring research software & Teespring Training Course for just $97 $67 for a limited time! Price may increase without notice. Instantly uncover the hidden golden nuggets and save time with your Teespring business! 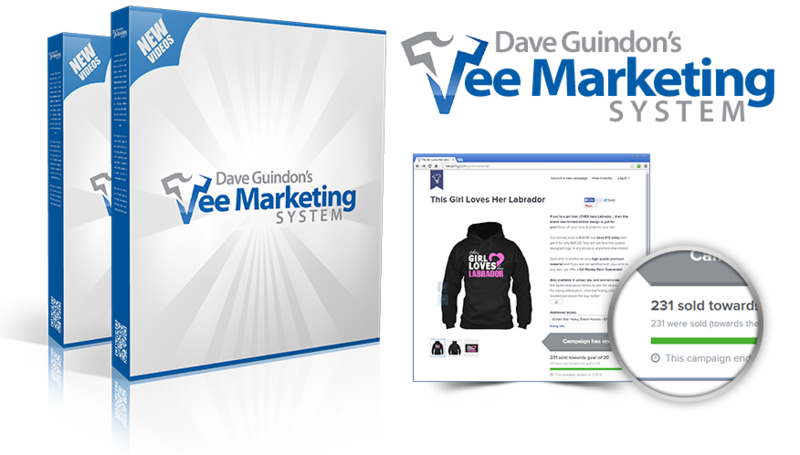 Quickly uncover hundreds of profitable t-shirt design ideas! Export data to interactive reports you can sell on Fiverr! Spy on other Teespring campaigns DAILY sales data! Search the massively popular product social network called Wanelo for top trending designs! Instantly preview any given Teespring campaign by simply hovering your mouse over top of the link! Stop wasting your time flipping through hundreds of Teespring pages .. by simply moving your mouse, you can see exactly what you want in milliseconds! 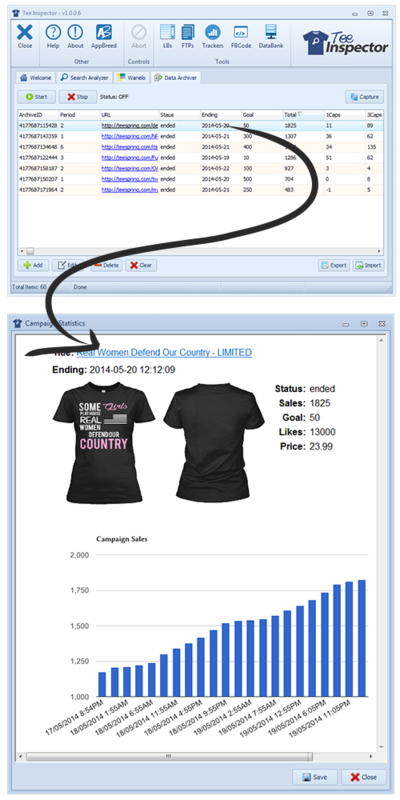 With just a click of your mouse, instantly preview all Teespring shirt campaigns in an interactive data table. You can sort each column as well as search by keyword. Plus, the results will "filter-as-you-type" into the search box .. in real-time! AND ... you can SELL these reports as HTML files to your customers or as Fiverr gigs! There are more ways to make money with this powerful software! Quickly find new fresh t-shirt design ideas using the massively popular social network called Wanelo .. "Want, Need, Love". Wanelo is a social network for making it easier to discover amazing products and stores and share with your friends ... which makes it a PERFECT place to find top trending shirt ideas! 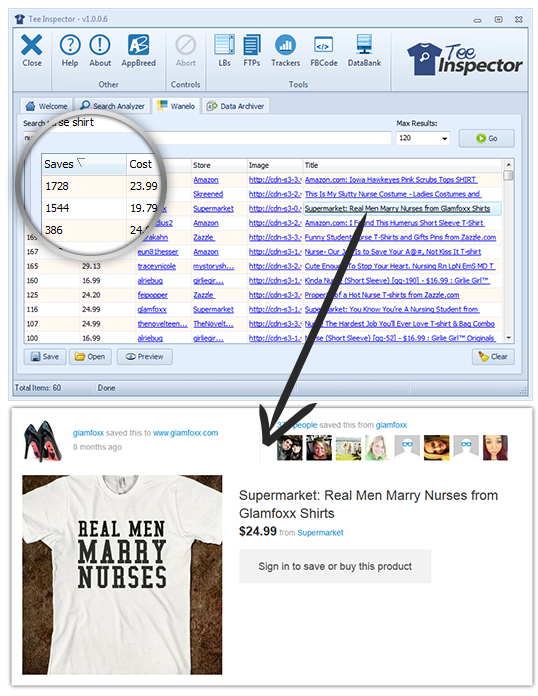 Quickly sort by the number of "Saves" will show you the top trending shirt designs based on what people WANT TO BUY! That's the big difference with this site, a "save" represents the "intent to buy"! And this tool is the ONLY tool you can use sort by Wanelo saves with just one click! Heck .. you can't even sort by saves on the Wanelo website itself! How would you like to see the DAILY sales for all your competitor's campaigns? OR .. how would like to see their HOURLY sales data? You can now spy on ANY Teespring campaign by allowing Tee Inspector's Data Archiver tool log sales for any given campaign link based on a time period you set! 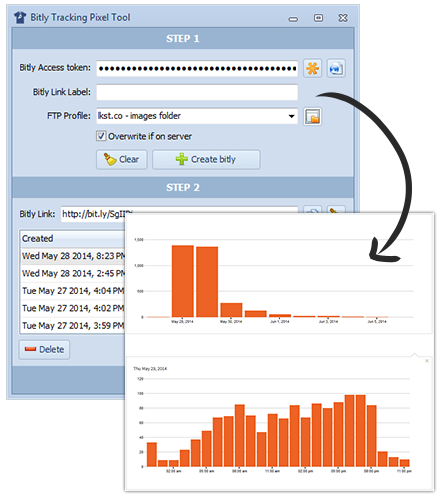 You can set the Data Archiver to collect data every hour, or every 2, 3, 6, 12, 24 hours! PLUS ... you can log your own sales data for all your own campaigns! Quickly see which designs are getting the most sales per day! Know which one of your designs is selling within the first couple hours! Find out your exact earnings per hour! See what days of the week bring in more sales! See what times of the day get more sales! Use the statistics to dial in your campaign for maximimum profits! We've even included a Logins & Bookmarks tool making it easier than ever to get to the important sites FAST! With a double-click the software brings you to the login or bookmark page in a snap. 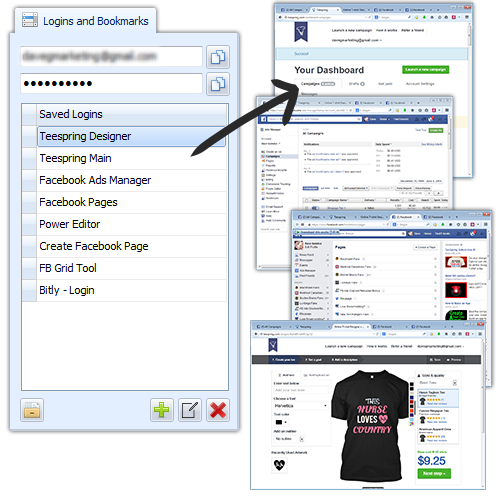 Use the "copy-to-clipboard" buttons to quickly insert usernames & passwords into the web sites with login pages. Bookmark ANY web page you want ... or any page that requires you to login. Use this tool for quick easy access to the important places you need to go for running your Teespring business. Here's another powerful tool I integrated that will SAVE you a whole lot of time! After creating over 130 Teespring campaigns and over 1,000 of Facebook ads ... I needed a tool for quickly getting access to common content I use all the time. For example, I like to use similar content in all my Teespring campaign descriptions and Facebook ad copy, and with the Data Bank tool, you simply "double-click" the selected item in your list, and BOOM ... it's copied to your computer's clipboard for you to easily paste anywhere you want! This tool has saved me HOURS and HOURS of time ... and allows you to quickly bang out over 10 campaigns per day with total ease! You can even use this for ANY content you want, like common email messages, subject lines, customer response emails, links, codes, .. anything you want! One of my secret methods for monitoring real-time traffic to my Teespring campaigns is using a Bitly tracking link as a hidden image directly inside of my campaign descriptions! BUT, the problem with this method is it's very time consuming when you are listing several campaigns per day. So I developed this Bitly Trackers tool to make it SUPER-FAST! Once you set your FTP information and insert your free Bitly API code ... all it takes is a single click of your mouse and this tool pumps out the exact link you insert as a hidden image in your Teespring campaign description. NOTE: As part of the included "Tee Marketing System" training course, I show you step-by-step how you can do this for your campaigns. 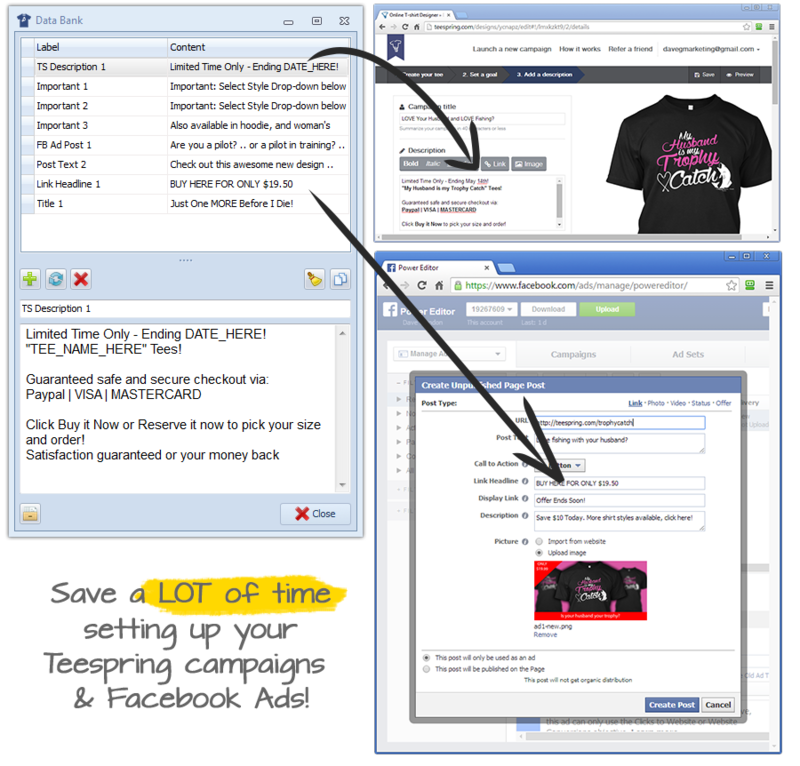 One way to track your sales on Facebook is using the Conversion Pixel feature in your Teespring campaign settings. I use this feature to optimize my Facebook ads for higher conversions, then I scale up the campaigns for maximum profits. The FB Code tool simply makes it extremely fast to get your conversion pixel number from the Facebook code ... simply copy and paste the Facebook code into the FB Code tool and the conversion pixel magically appears. Then insert that code into your Teespring campaign and you're good to go! Watch over my shoulder as I take you through the entire process of creating several successful Teespring campaigns .. step-by-step! Watch how I made over $231,000 selling t-shirts on Facebook using Teespring and newsfeed ads in just 3 months! In this course, you get to watch over my shoulder as I list live campaigns on Teespring, and show you how to setup everything from start to finish. In Module 5, you get to watch me list 10 live campaigns and after 7 days make $721.70 in PURE PROFITS after all ad costs! Everything is shown and NOTHING is held back! In this module I take you through several different methods for selecting profitable niches to design t-shirts in, as well as, a quick-start introduction to Teespring. This step is the most important to get successful campaigns running fast, one mistake here and you can lose thousands of dollars in lost profits! In this module I take you through the process of researching, designing, and creating ads for 3 separate design examples. Plus, I briefly touch on trademarks and copyright issues and where you can find more information online. This is the missing element in most Teespring training ... most other courses don't show you how to design nice professional looking shirt designs, because most of them outsource their design work. Which is also very important for scaling out your tshirt business. But, it's important to know how to work with your design graphics so you can easily make edits and pump out quick designs for testing. Also, it's getting harder and harder to find a good designer ... in fact, I see many Teespringers going through 10 to 20 designers until they find one that actually does what they want! With my photoshop training, you will have the skills to pump out your first designs NOW .. and also give you more skills for finding the right designer that fits your needs & requirements! Every Teespring vendor should have some graphical skills with photoshop or some other graphics software. BONUS: We have a secret "backdoor" discount link for Photoshop CC, where you can get full access to Photoshop and Lightroom for just $9.99/month .. instead of buying it at $700! Ten bucks a month is an absolutely steal for Photoshop!! Just think if you paid the full $700 .. that's nearly 6 years of monthly payments! I'm sure you will be able to pay for photoshop within 6 years from now. This discount link is provided in Module 2! In this module I take you through the process of creating a full Teespring campaign using one of the design examples from Module 2. Here is where you get to see what shirt colors you should be using, what shirt styles perform the best, what prices you should set your shirt styles at, what are the best keywords for your titles, and how to write high-converting campaign descriptions that focus your ad spend on making money! In this module I show you how to create a fanpage, how to setup Facebook ads using the ads manager and Powereditor, and how to analyze the results. Creating awesome shirt designs and the best Teespring campaigns on the planet is only HALF the battle! You still need to send high-quality targeted traffic to your campaigns to make those profits you so deserve! So, in this module you see how to setup your ad campaigns to gather data, then analyze the data to optimize your profits. This is where most marketers fall short and fail! .. I am one of them!! I've failed many many times ... but you DON'T have to! Follow my steps and you'll be on your way to profitable campaigns very quickly! This module contains 11 videos where I take you through the FULL process of creating 10 shirt campaigns in the sports niche for 2 separate designs applied to 5 sports teams. You get to see how to properly list campaigns to spot the winners and close down the losers. 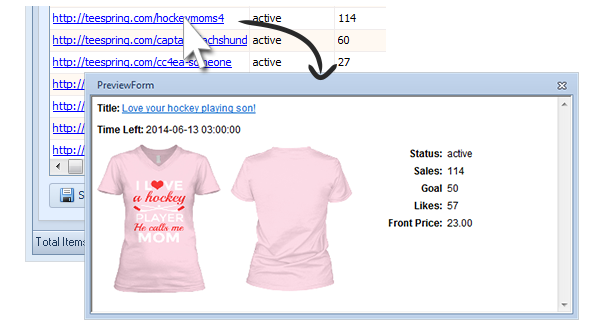 As a result, 2 out of 10 shirts made profit .. earning a total of $721.70 of PURE PROFIT after ALL ad spend! Plus, a 3rd winning shirt was created based on comments and feedback! You also get to see how to easily transform a campaign that has been removed due to trademark into a new winning campaign that makes profit! In this module I go through several previous successful Teespring campaigns I’ve created that earned thousands in profits overall. I go through 7 more of my personal Teespring campaigns that sold over $20,000 in t-shirt sales using Facebook ads! You get to see the design, the number sold, and the exact ad copy, ad targets, and full results through the Facebook reporting tool. Use my designs to inspire you to design new and improved campaigns that will make thousands of dollars over and over again! In this module I have included several miscellaneous videos showing lots of very useful tips & tricks I’ve learned over the years as well as stuff I learned from selling on Teespring. how to create curved text along any path in photoshop! Run your own t-shirt contest and go viral, collect leads and boost your next Teespring campaign with socially powered contests inside your WordPress blog! Catapult your Teespring t-shirt sales with socially powered viral contests! Combine the power of your WordPress blog and your Teespring campaigns to create an engaging contest that builds your list FAST and goes viral at the same time! Change the Search engine settings and add your tracking code. Add any auto-responder code from Aweber, GetResponse and more. Easily pick a date and have your page countdown to increase scarcity. Complete control over every detail of your custom branded contest page. Create hyper-focused pages or add your own content for more information. Add images to your t-shirts, logo, background and more for a better design. Click the "Buy Now" button to get instant access now! 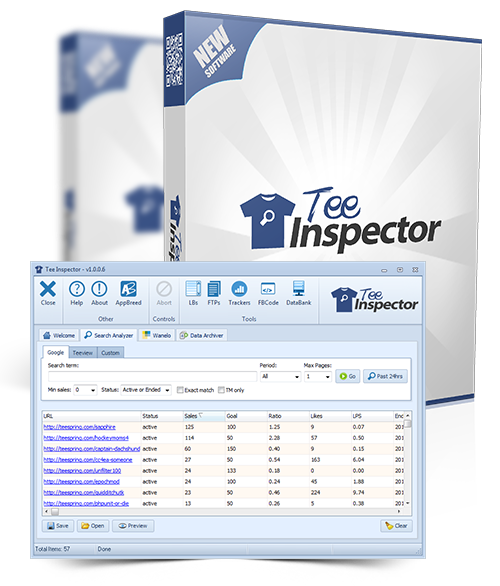 Does the Tee Inspector software work on a Mac computer? Sorry, but this software is for a PC running a windows operating system. But, you can run Windows software on a Mac by installing the free VirtualBox virtualisation software, and then install a copy of Windows inside the VirtualBox software on your Mac. There are several videos on YouTube that show how this can be done. Is there an upsell product and do I have to buy it? Yes, we just included an upsell product which is completely optional and is NOT required. The upsell product is a collection of over 62 t-shirt designs I have personally designed for Teespring campaigns. There is also a second completely optional upsell for a very powerful WordPress plugin used to create amazingly beautiful show case pages for your Teespring shirts. What format are the Tee Marketing System training videos in? All videos are provided as MP4 downloadable files you can watch on your PC or Mac computer. You can also optionally watch each video within your members area using the built-in video player. Most computers already have a video player installed, but if you do not, we recommend the free VLC video player. Simply search Google for the keyword phrase, "Download VLC Player" to find the download page link. We also provide this link in the members area. How many computers can I install the software on? You are permitted to install the software on 3 personal computers that you own. This also includes Mac and PC. If you need your account reset, simply contact our support from inside your members area and we'll take care of it right away. 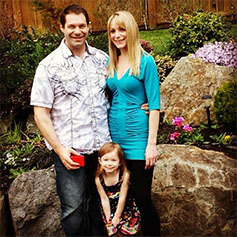 "Our little family ... with a NEW baby on the way! Nothing can explain the feeling of having the financial freedom to provide my loving family with everything needed. All this done through learning and acting. Follow me and I'll show you how!" Copyright 2014 - Present, TeeInspector.com, All Rights Reserved.